If your house is anything like ours, you’ve got a pantry full of assorted bags, boxes and containers of oddball ingredients left over from your last few ambitious cooking projects. It’s a shame to let all that great stuff languish in the cabinet, so I look for recipes that use it up. 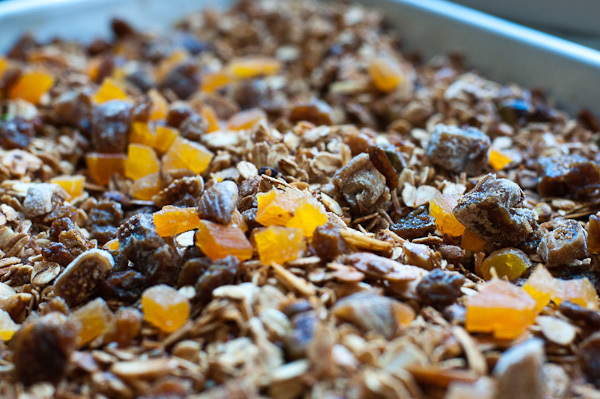 Making your own granola is a great way to do this. It requires lots of nuts, seeds and dried fruits, and a little coconut and spices don’t go amiss either. Best of all, it reduces kitchen waste and is a lot cheaper than the fancy store bought stuff. I’ve always thought granola a rather strange word. Scottish maybe? Grrrrrranola! Maybe not. You’ve heard of Graham crackers right? They were created by the Rev. Sylvester Graham, a conservative Presbyterian minister who believed that vegetarianism was a cure for many problems, including alcoholism and lust. To help with these things, in 1829, he created Graham flour, a form of whole wheat flour in which the three parts of the wheat kernel (endosperm, bran, and germ) are ground separately and then mixed back together again. At the time whole wheat flour was mainly eaten by the poor who couldn’t afford fancy white flour, so it was a bit shocking for Rev. Graham’s more well-to-do acolytes. Along the same lines, a Dr. James Caleb Jackson who had experienced a miraculous recovery from life-long illness after taking a water cure, decided to open a hydrotherapy center in Dansville, NY. Along with lots of baths in stinky mineral water, he advocated a strict vegetarian diet. As part of that, in 1863, he invented a breakfast food for his patients called Granula (Latin for “small grain). It consisted of a mixture of Graham flour and water baked in to hard sheets and then broken in to pieces and baked again. Finally, it was ground up into small pieces. The resulting cereal was then soaked overnight in milk so the patients could chew it without breaking their teeth. Meanwhile, at the Battle Creek Sanatarium in Battle Creek, MI, in about 1876, J.H. Kellogg (an enthusiast of Rev. Graham’s work) was also treating his patients to a strictly meat-free diet. He created a breakfast food made of wheat, oat and corn meal which was mixed with water and baked into hard crackers which were then ground into small pieces. He called it Granula too. When he tried to sell it, Dr. Jackson threatened to sue over the name, and so Kellogg changed it to Granola. 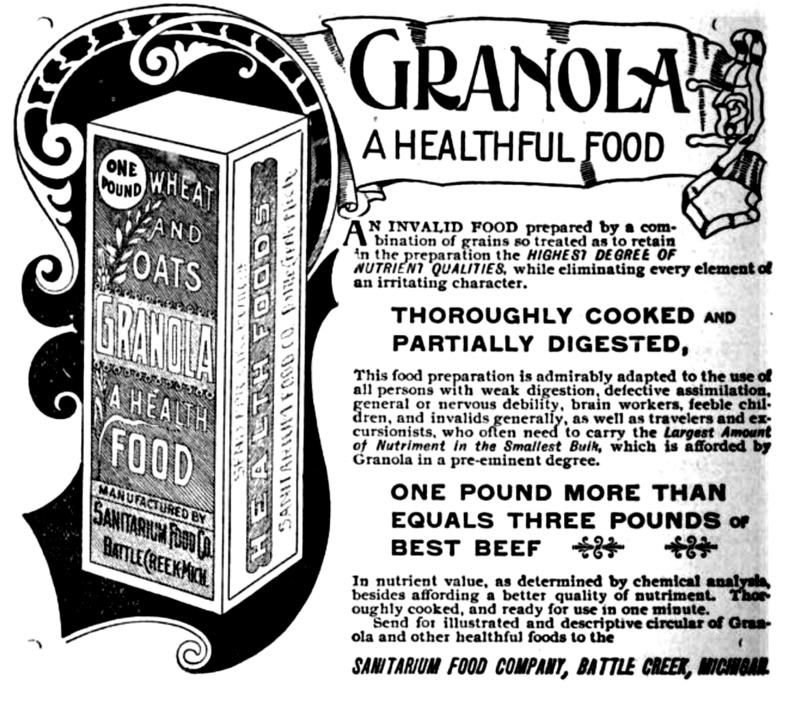 The closest cereal we have today to both Granula and the original Granola is Grape-Nuts, which was actually invented by a former patient of Dr. Kellogg, a Mr. C.W. Post. Back to that kitchen cabinet overflowing with dried fruit and nuts. They do go off you know. The nut oils can go rancid and I have found that some dried fruits eventually shrivel up into little rocks that could be a danger to your dental work. If you’ve got two or three kinds of nuts, a couple of different dried fruits, and a box of “old fashioned” style oatmeal, you’ve got the makings of granola. Pre-heat you oven to 350F. Mix the oats, nuts and seeds, coconut, cinnamon and honey together in a large bowl, then sprinkle with some sea salt and stir again. Be sure to mix it well so the honey coats all of the pieces. Spread the mixture out evenly on a rimmed baking sheet. Bake for 30-40 minutes, stirring occasionally to ensure even browning. Make it as dark and crunchy as you like, but be careful not to let it burn. Take your pan out of the oven, sprinkle the dried fruits over it. Put the pan of granola on a cooling rack and allow it to cool to room temperature, stirring occasionally.